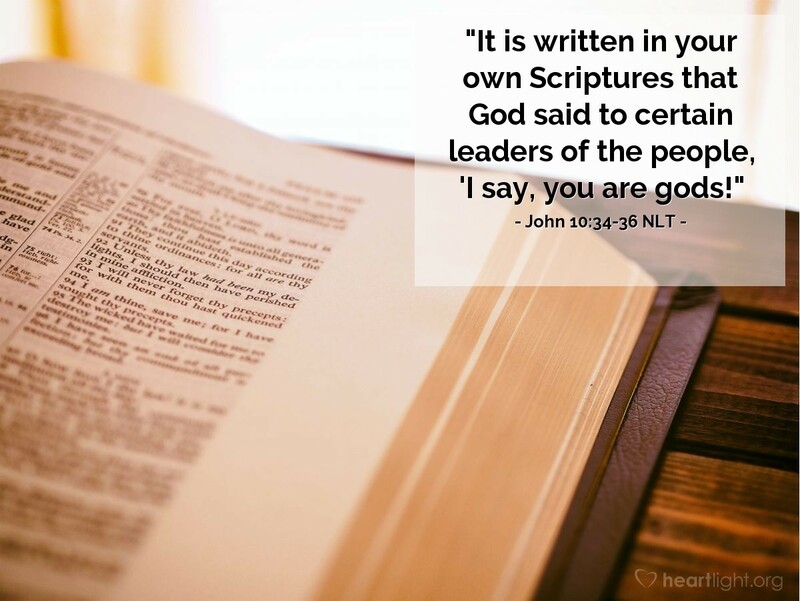 Jesus replied [to the Jews], "It is written in your own Scriptures that God said to certain leaders of the people, 'I say, you are gods!' And you know that the Scriptures cannot be altered. So if those people who received God's message were called 'gods,' why do you call it blasphemy when I say, 'I am the Son of God'? After all, the Father set me apart and sent me into the world." The religious leaders of Jesus' day used all sorts of legalistic logic to win their religious debates. Several times in Jesus' ministry, especially toward the end of his ministry when he was in Jerusalem where they were trying to trick him with religious questions, Jesus defeats the religious teachers and leaders using their own logic. They want to charge him with blasphemy because they won't believe. Even without their believing, Jesus uses their own logic to show why they can't convict him of blasphemy. They can't win at their own games because Jesus is greater than they are and he knows what is in their hearts. Let's let this be a reminder that if we play religious games, Jesus can see through them. He challenges us to come to him and find life, not shallow religiosity or feelings of self-righteous superiority. Forgive me, Father, for sometimes playing religious games. I truly want to have genuine faith, and I know that you long to give me life through that faith. Mold me and make me more into a person of character and faith. I ask this in Jesus' name. Amen.